In any property, regardless of age and even if built strictly in accordance with Building Regulations, noise produced by music, shouting, walking, etc. will always be audible. Noise pollution is often worse in the evening when normal daytime background noises have ceased and the ambient background sound level drops. To tackle the issue you really need to identify the type of noise: impact - e.g. footfall or hammering, or airborne – e.g. talking, TV, radio etc. ; and the source of the noise e.g. floor, ceiling, wall or a combination. This is a floor that is 'isolated' from the existing structure by a 'resilient' layer. Next, a resilient layer, such as Isobase R50 is placed over the bare floor and a new tongued and grooved (T&G) floor is placed on top with all the T&G joints glued and sealed together. 22mm Tongued and grooved (T&G) boards make a good overlay but for even better results use our Cement Impregnated Particle Board. NB: It is imperative that the resilient layer does not touch either the walls or the skirting. When the resilient layer is in place, the small perimeter gap should be sealed with flexible sealant. Installing this system will increase the floor height by approx. 30-40mm therefore all the doors and/or thresholds will have to be adjusted accordingly. A 15mm floating floor is available if height is an issue. This product can be simply laid, or bonded, to the floor. NB It is essential that the sheets are laid in a staggered, brick type pattern, and that they are butted tightly together and up to the perimeters of the room. Due to the 15mm thickness it is best to first run a 9mm thick timber batten, the same width as the grippers (about 25–30mm wide), around the room perimeter. The grippers can then be nailed into this raised batten. Caution: if your sub-floor is not level then you will need to bond the sheets down to prevent any subsequent lifting due to bowed flooring. In older properties even if you have levelled out a floor using chipboard it is still possible that the small irregularities are dealt with but the overall floor may rise and fall in line with the old joists. 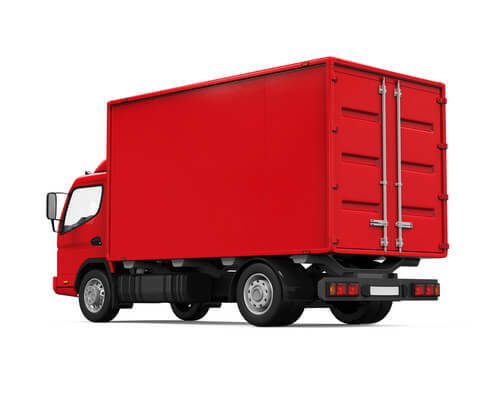 Small sheet material may want to 'lift' in certain areas if it is not bonded down. If lifting the floorboards is not feasible, seal any gaps between the floorboards with Acoustic Sealant to make the base floor airtight. Then glue one or (preferably) two layers of T50 or VL-65 acoustic membrane (laid in opposite directions) onto the base floor using our Spray Adhesive and sealing any joints with our heavy duty duct tape. You can then install/replace the final floor finish. (This is the absolute minimum you can do to reduce airborne sound but is often not enough). Option 1A: if carpet is the final floor finish, then (for increased acoustic performance over Option 1) lay Quietfloor Premium+ slabs on top of the T50 or VL-65 and glue in place with Spray Adhesive before replacing the carpet. Underlay is not required. In addition to improved acoustic performance Quietfloor Premium provides a very comfortable and forgiving surface to walk on. If you are prepared to lift the floorboards, you can fit our 100mm-thick fire-safe Acoustic Mineral Wool in between the joists. Replace the sub-floor then follow Option 1. For improved results over Option 2, substitute the 100mm mineral wool in the previous installation with our high performance 2FTex quilt in between the joists. Replace the sub-floor then follow Option 1. If carpet is the final floor finish, then (for increased acoustic performance over Option 3) lay Quietfloor Premium+ slabs on top of the T50 or VL-65 membrane and glue in place with Spray Adhesive before replacing the carpet. Underlay is not required. Many people find squeaking floorboards extremely irritating and they are best dealt with before adding any sound-proofing materials to the floor. This noise is usually caused by boards rubbing against boards or joists, most commonly caused by poor nailing where undersized nails have been used or if the nails are spaced too far apart. The best way to cure this problem is to screw, rather than nail, the boards down firmly. Squeaking floorboards can also be the result of defective materials. Warped or twisted joists, bowed subfloors or wood sheathing can all result in friction between different components of the floor structure. Sometimes just adding some mineral oil around the squeak will soothe the friction but this tends to wear off after time and the problem can recur. However, this solution is useful for tongued and grooved flooring that has weak or broken tongue/groove interlocks, and oil can be reapplied as required. The results you will get from any of the above configurations will depend on the quality of workmanship and materials used. Custom Audio Designs can take no responsibility for the installation or for products from other suppliers. The acoustic improvement achieved by any of the solutions recommended above may possibly be limited by ‘flanking noise’. This phenomenon is caused by noise being transmitted not only through the floor but also by way of adjacent walls that touch the separating floor. The extent of this ‘flanking’ manoeuvre can vary from one project to another, depending on the existing structure. 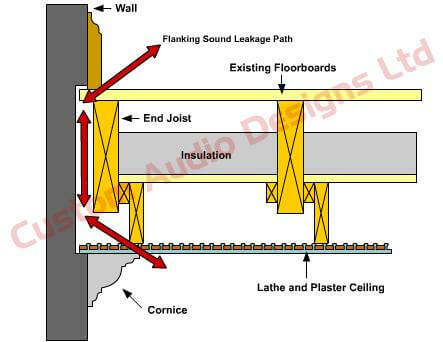 For example, if a concrete floor slab is built correctly into the wall, then the floor acts as an added barrier to the sound trying to infiltrate via the side (flank) wall; but if the floor slab is just butted up to the wall and the wall leaf is continuous between houses, there will be excessive flanking noise transmission. In this case you will have to treat the walls as well as the floor and/or ceiling. Another typical example of bad conversion is where the end floor joists run parallel to the party wall. Insulation may even have been installed in the past but failed to seal the gap between the end joist and wall. It is worth checking the floor structure before installing any soundproofing products to see whether flanking noise is also likely to be an issue, and to identify any other hidden problems with the building construction. Failure to treat walls as well as floors/ceilings where necessary will result in only a limited reduction in noise transmission levels and continued persistent noise disruption.